My kid’s loves pasta, so I make it very often; they like only a few shapes, rotini and penne are their favorite. I also like it when it has tomato sauce in it. For change I decided to make it with pesto. I know if I put pesto alone my hubby will say it is bland. We love spices so thought of adding chipotle, lime, garlic and shrimp to get another layer of taste to pasta. 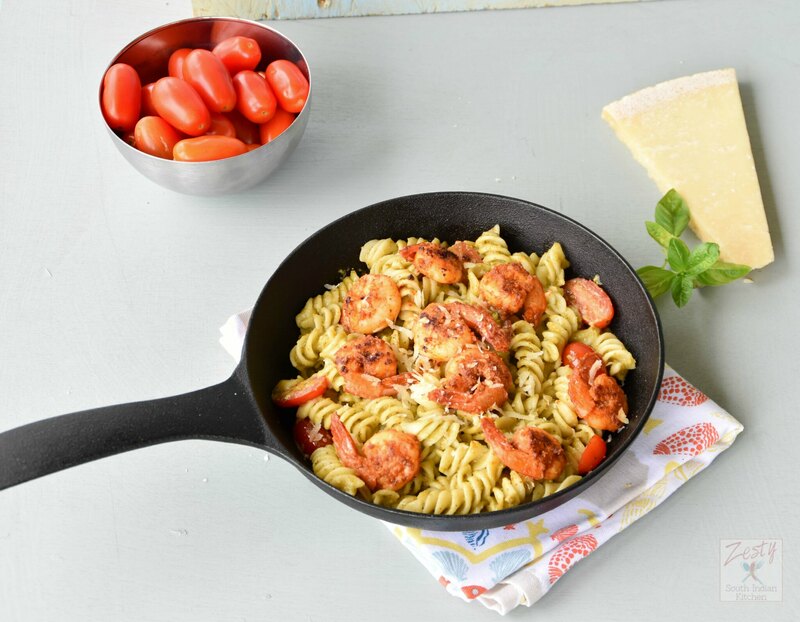 Spicy shrimp enhanced the taste of pasta and made it into a Gourmet pasta meal. I was so happy to find La Moderna’s Golden Harvest Rotini Pasta at my local Wal-Mart. My daughter immediately said mama can you make pasta with it, I want to eat it. Do you know La Moderna’s Golden Harvest Rotini Pasta is made of 100% Durum Wheat, which is used to make authentic Italian pasta? It is also a high protein pasta.I believe that traditional recipes are always the best and when home cooked meals it is tastier than pasta at any fancy restaurant. Also La Moderna’s pasta is very easy to cook and to blend with any sauce. I know Chipotle pepper, lime and garlic go well together with shrimp so made a spicy marinade first and let it rest for about 30 minutes so that it gets blended well. Then cook it in butter until shrimp cooked well. At first thought of making pesto sauce at home. But due to time constraints, I decide to use a store bought one. If you have homemade pesto sauce in hand use that. This recipe is very simple, all you need to do is to cook pasta and then add pesto sauce and cherry tomatoes. Then add cooked shrimp and finally add grated Parmesan cheese to finish it off. I added very less cheese, but you can add more or less depending upon your taste. Normally in my house pasta is made for dinner, but this I made it during the day so it became our lunch. My hubby gave me a thumbs up on this recipe, trust me getting a thumbs up from him is difficult task. It should really be good otherwise he will tell me it is good but please don’t make it again. My daughter too enjoyed it. 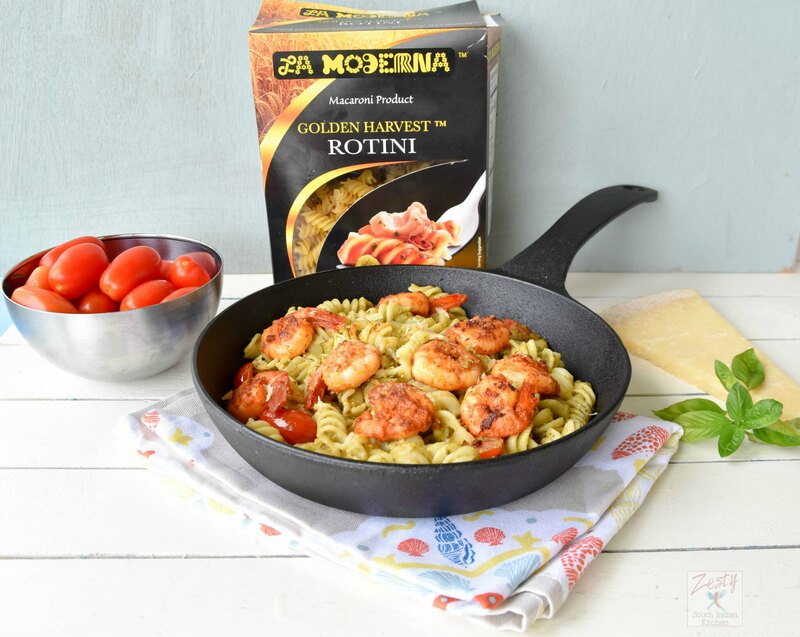 If you are looking for simple yet delicious pasta meal like me then try to grab box of La Moderna’s Golden Harvest Rotini Pasta from your local Wal-Mart and make this. You are going to get praise for this meal I can guarantee that. While pasta is cooking ,in a bowl add shrimp, chipotle pepper and rest of ingredients for the shrimp and mix everything and set aside for 20-30 minutes. 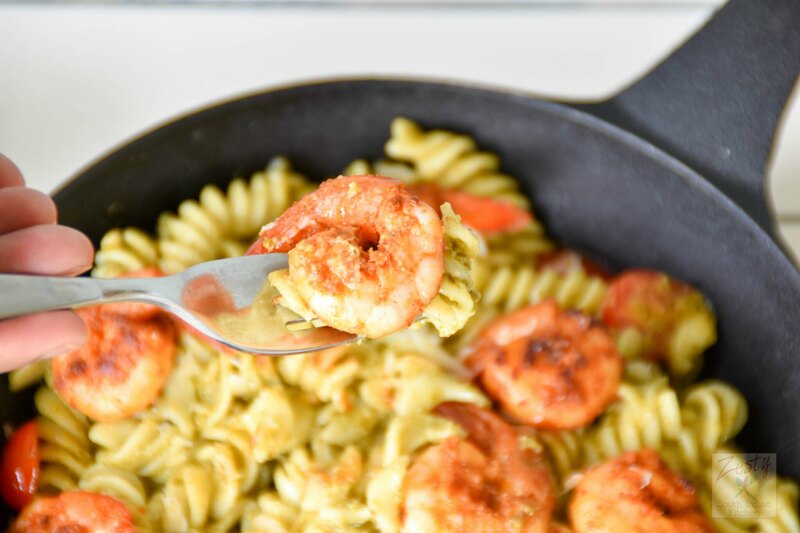 While pasta is cooking add 1 ½ tablespoon butter in skillet and add marinated shrimp and cook until it is well cooked (shrimp will curl itself) and spices coated well. 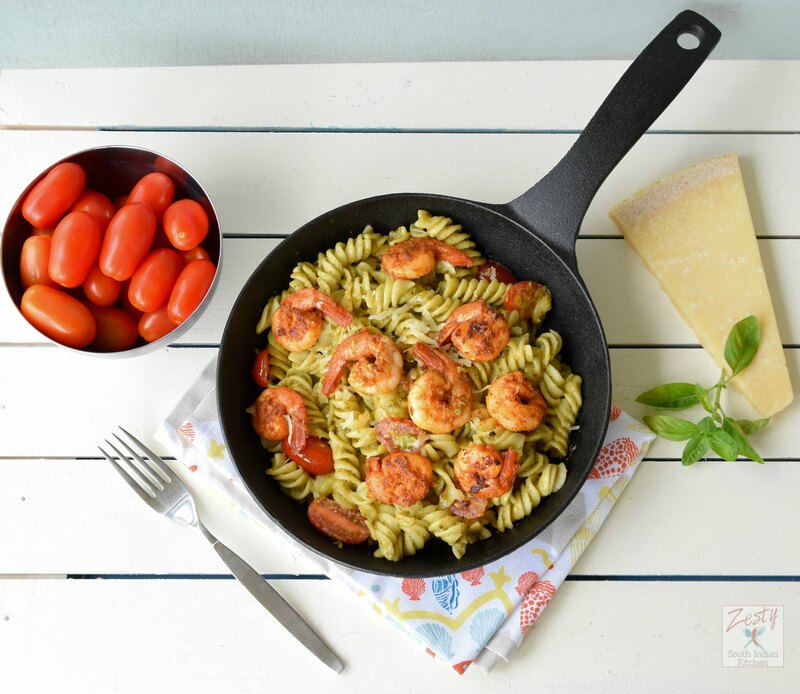 In a skillet add ½ tablespoon butter and add cooked pasta and add pesto sauce and 1 tablespoon of pasta water and mix everything until pesto sauce combined well with pasta. To this add halved cherry tomatoes and cook for 1-2 minutes. 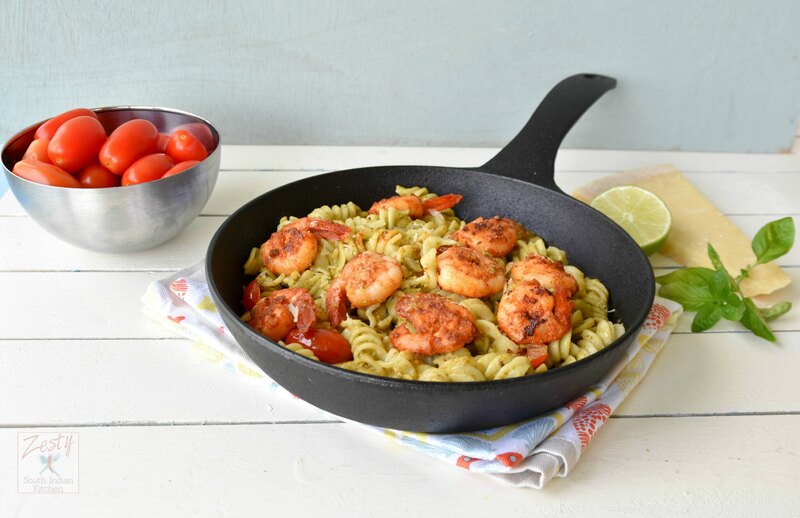 Delicious one pot meal with touch spicy shrimp and pasta. n a bowl add shrimp, chipotle pepper, paprika, garlic paste, coriander powder( if using ) lime zest, lime juice, salt and mix everything and set aside for 20-30 minutes. 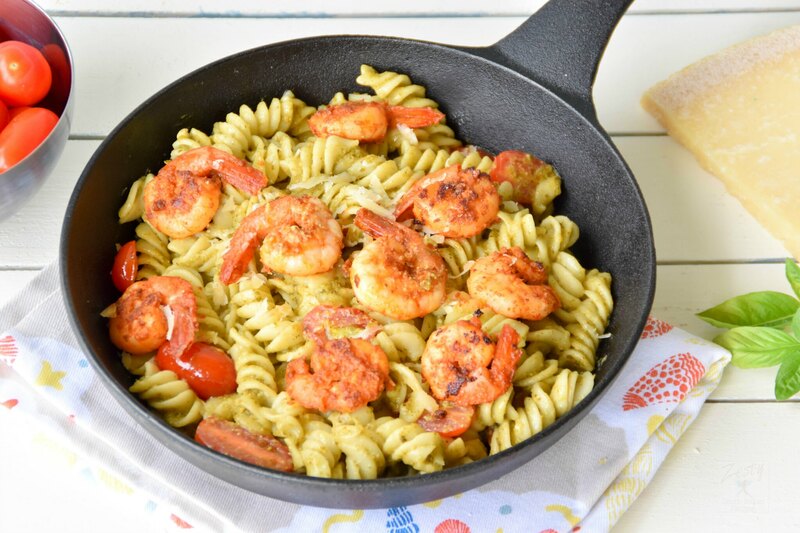 In a skillet add ½ tablespoon butter and add cooked pasta and add pesto sauce and 1 tablespoon of pasta water and mix everything until pesto sauce combined well with pasta. To this add halved cherry tomatoes and cook for 1-2 minutes. Wow this looks good. All those flavors on the shrimp! And, I adore that shrimp as so easy to cook. What a great dinner this will be. OMG! This looks so tasty and spicy. Love easy pasta recipes that look amazing. All of my favorite flavors in one dish?? RECIPE PERFECTION! Can’t wait to try this one out! Wish that I could crawl inside your pictures and sample. Looks very good.